Building LEGO masterpieces is a classic geek endeavor, as is building crazy machines. 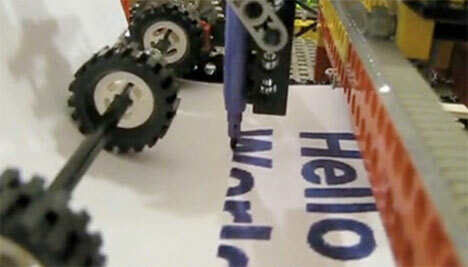 One mega-geek put those two pursuits together and came up with this LEGO printer that uses uses felt-tip markers instead of ink to laboriously sketch out words and pictures from the connected Mac. According to its creator, the awesome contraption prints a little slower than one page per minute at around 72 DPI. It’s not made from Mindstorms, the programmable LEGO robotics building kits, but rather from traditional LEGO blocks and motors. It took about three weeks of evening tinkering to build the machine, and we think it was worth every minute. See more in Do It Yourself or under Technology. June, 2010.